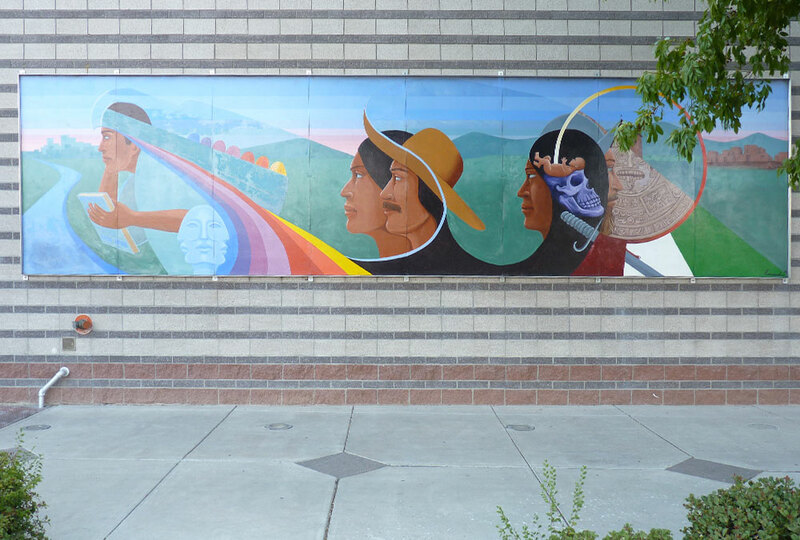 This work consists of a mural themed of 504 Years of Contributions of the Mestizo to the New World in conjunction with the 1996 Hispanic Cultural Festival. "A ray of sun is an umbilical cord for a Mestizo child. The skeleton represents the birth of conflict. The Aztec sun represents what was one of the most advanced calendars in the world. There is a symbol of the Spanish church. (Moving left), the Mestizo mother and father includes the demonstrating worker/farmer/rural roots. (On the far left), the silhouette of the eagle symbolizes freedom, hope, strength and progress; it also forms the mountains of New Mexico. (The eagle outlines) a contemporary Hispanic/Mestizo, who carries a book representing the future and the history and is moving into the urban future. The book also symbolizes education and celebration. The figure also carries objects, contributions that are at once a burden as well as a hope for the future." --Emanuel Martinez, Preliminary drawing for Hispanic Culture Festival Celebrating the 504th Birthday of the Mestizo. Leopoldo Romero is a fine art painter, muralist, sign artist and sculptor who was born in Agua Fria Village, Santa Fe, NM. He attended the East Los Angeles College where he studied art and advertising. Romero has worked with neighborhood associations, public schools, non-profits and community organizations for "at risk" youth. He continues his artwork in Albuquerque, NM. Emanuel Martinez was born in Denver, CO in 1947 and began his career painting murals around the age of 13. He is a muralist, painter and sculptor who established his studio in 1968 and has received international acclaim and prestigious awards for his design and high standards of workmanship.